Include directive is used for merging external files to the current JSP page during translation phase (The phase where JSP gets converted into the equivalent Servlet). Why we need to use the include directive? 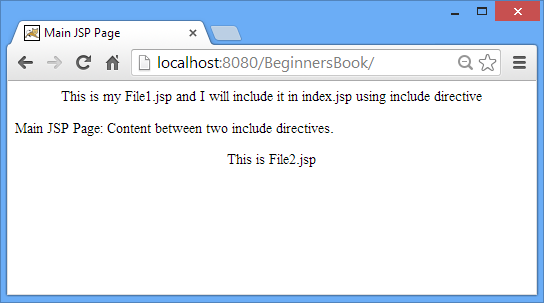 Can’t we simply add the file’s content in the current JSP instead of using the directive? We can copy the content of external file and paste it in the main JSP, however it would not be a good practice. Let’s understand this with the help of an example – I have 100 external files and 1 main JSP file. If I just copy the content of all files in the main JSP then I have to edit it whenever there is a change in any of the external file, instead we can include all files using directive and edit the particular file whenever needed. Also, by using include directive you can enhance the code re-usability – Suppose there is a certain code or data which needs to be there in all the JSP pages of your application then you can simply have that code/data in one file and include the file in all the JSP pages. The above two reasons can be considered as advantages of using include directive. This is the syntax of include directive in JSP. If file is in the same folder where the current JSP page resides then we can just mention the file name else the relative path to the file needs to be specified. Main JSP Page: Content between two include directives. output: The output would look like this when you run the above code. As you can see we have included the content of file1 and file2 in out main JSP page with the help of include directive. Let us know if you have any questions regarding it. how do v validate data typed by a user in a registration page? is it possible using jsp ? can i include java script in jsp ?